Image | This entry was posted in The Boys and tagged bugsy, cat art, cats, Double Trouble, humor, Knuckles, Lou Belcher, whimsy. Bookmark the permalink. We are waiting for <u, to wake up so she can put our Dr. Seuss post on!! Love Dr Seuss. Nice one. Have a marvellous Monday. 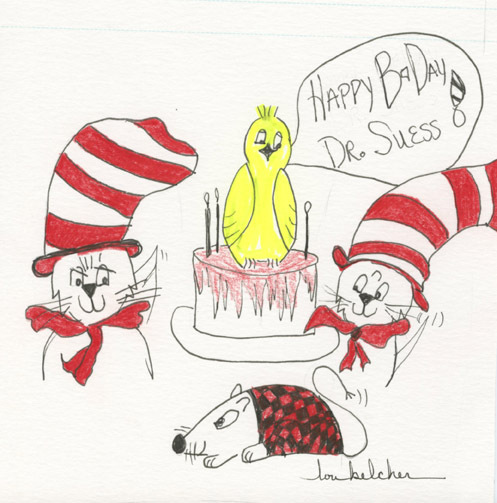 Happy Dr. Seuss Day! Please visit us for our cat in the hat themed giveaway. We suppose your FAVORITE Seuss book is…. One Fish Two Fish… Right? Just adorable! Happy Dr.Seuss Day! That’s such a great drawing of you two. Happy Dr. Seuss Day! We love your drawing for Dr. Seuss Day!